The Martin Luther Memorial Evangelical Centre for Diaconia and Education (Ewangelickie Centrum Diakonii i Edukacji im. ks. Marcina Lutra, ECDiE) was founded on May 4th 1999 by the Wrocław Diocese of the Evangelical Church of the Augsburg Confession to educate children and youth. The activities of ECDiE focus particularly on working with the physically and intellectually disabled youth. The Center is also active in the care for the elderly and chronically ill.
ECDiE educates young people aged from 12 to 24 from all over Poland. The education covers secondary level and is carried out in free public special schools: The Integrated Lower Secondary School, The Upper Secondary School, The Vocational Upper Secondary School for Business Studies, The Basic Vocational School, and The Special Vocational School. Also, in 2001 The Polish-German Nonpublic Primary School and The Nonpublic Kindergarten “Happy Notes” (for children aged from 2.5 to 6) were established. 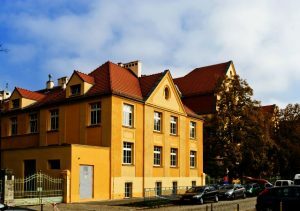 Several hundred students attend the Center’s schools, and about 50% of them are people outside of Wrocław who have the opportunity to live in a free boarding house. The programs we carry out in our facilities are primarily meant to help students to develop and gain self-esteem taking into account their individual level of maturity and faith. At the same time, ECDiE runs two Social Assistance Houses, “The Samaritan” and “The Good Samaritan”, where the elderly and chronically ill are taken care of. We help inmates in everyday health care and in dealing with current everyday life issues. In addition, ECDiE operates The Ecumenical Care Unit with the primary goal to help enable 60+ people, offer home assistance for the chronically ill, and provide psychological support for patients and their families.